http://youtu.be/d7Ldx3axnOY A friend shared that she and her son count the stairs as they climb them. We thought this would be a great way to introduce Cooper to counting too. We typically count the stairs as he scoots down them on his bottom. Looks like the 1-10 words and order are starting to stick, especially 1-6. He loves to say “fast” and go find his grocery cart to run around the kitchen loop over and over again. 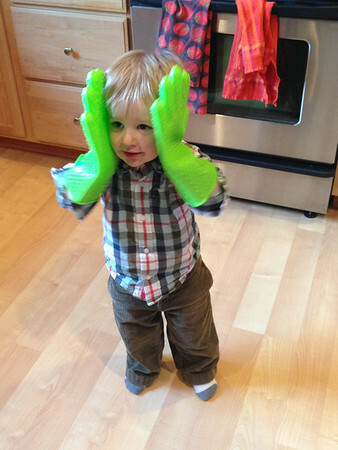 Cooper loves to play with these oven gloves. He has found hours of entertainment in shaking people’s hands and saying “nice to meet you” to today reenacting a “Home Alone” face.